Shopping centers are very convenient shopping places as well because they have spacious parking lots and are open until very late… At Stoja 14A there is a large shopping centre Max City. at Ul. Rimske centurijacije 101 Pula City Mall , and Super Konzum at Šijanska cesta 1 are large supermarkets also offering non-food products. At these shopping locations you can find shoes and clothes shops, perfume shop ect. Nearby, at Labinska Street 2a is Lidl, and if you continue straight through the roundabout, towards the city center, there are two other shopping centers: Kaufland (Jurja Žakna 3) and Plodine (Jurja Žakna 12). Shopping center Spaar is at Santorijeva 13. Four times a year there are special shopping offers in Pula when most shops in the city center offer at least a 15% discount on all merchandise. Love Shopping is organized for Valentine’s Day and this year it will be held on February 14. A prize competition will be organized as well. Late Night Shopping, in June brings a music program and fashion show to the city centre, which surely makes shopping (shops are open from 8 pm until midnight) more enjoyable and fun. This year it will be held on June 22. Let’s shop in Pula is a shopping event held on October 5. Shops are open from 5 – 10 pm. 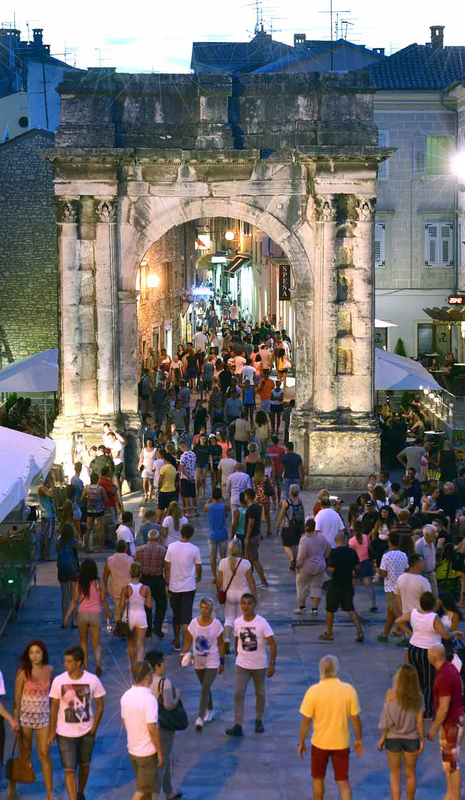 Let’s shop in Pula is associated with the Crafts Fair and this is a chance for everyone to enjoy the music program at Portarata Square and the marketplace. Shopping on St. Nicholas Day is associated with St. Nicholas Day — December 6. This year it will be held on November 30. This shopping event is usually held on Saturday before St. Nicholas Day.